Protesters against rising prices, rampant inflation, living conditions and economic corruptions took to the streets in several cities in Iran. The first major wave of demonstrations across the country since 2009 have raised concerns among the Islamic Republic’s authorities who have threatened the protesters with major crackdowns. On Friday, December-29, one day after protests stormed the city of Mashhad and several other cities in Khorasan Razavi province, demonstrators took to the streets of several other cities across Iran. The protesters chanted slogans against the head of the state, Ayatollah Ali Khamenei as well as the elected government of Hassan Rouhani. Economic conditions, rising prices of food and energy, lack of access to social services were manifested in protesters slogans. Aside from economic hardships, protesters were also chanting “neither Gaza nor Lebanon” as well as “let go of Syria,” objecting the state’s policy of supporting Hezbollah in Lebanon and the government of Bashar al-Assad in Syria. The protests have now spread to Kermanshah, Esfahan, Rasht, Khoramabad, Ahwaz, Hamadan, Qom, Zahedan and other cities. Images of these protests are now circulating social media sites. In recently earthquake stricken Kermanshah protesters demanding control on prices and relief for earthquake survivors. In all cities security agents attacked protesters with tear gas and batons. Arrests have been reported but the number of those detained is not yet known. 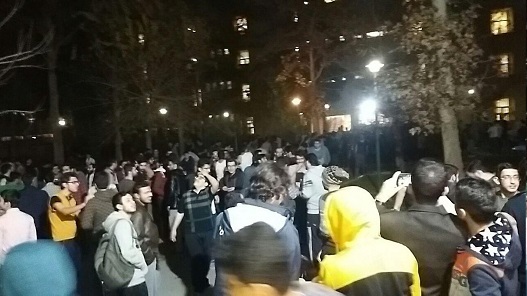 Small protests were also reported in the capital city, Tehran with some arrests. Tehran’s Provincial Security chief has announced that any form of gatherings in the capital’s squares and centres will not be tolerated. Mohsen Nasj Hamadani Tehran’s Provincial Security Chief has said that “anti-Revolutionary agents” are planning on staging protests against rising prices. He stressed that no permits has been issued for such protests and therefore, security forces have been alerted to confront possible attempts at staging demonstrations or protests. 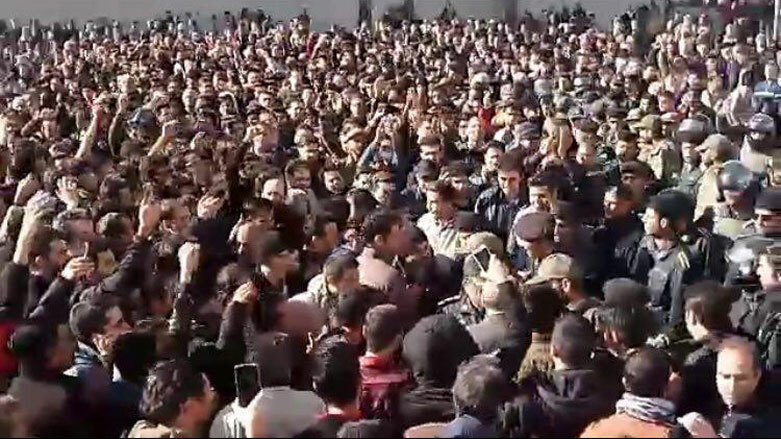 On Thursday December 28, hundreds of protesters gathered in front of Mashhad City Hall under the banner “No to Rising Prices.” Security forces confronted protesters with violence and later announced that 52 people were arrested. In social media, the posters of invite to protests in Mashhad were published and attributed to hardliners who are trying to pressure the government of Hassan Rouhani. However, hardliners plan had backfired with masses of people joining the protests chanting against the hardliners as well as the elected government. Mashhad’s Friday Mass Imam who is a hardliner, has attributed the organization of the protest to an “unidentified source” adding that anti-Revolutionary agents are trying to take advantage of people’s legitimate social demands. “These are usually ignited from outside the country by such groups as the monarchists and Mujahedin-e Khalgh (MKO)..we know which sites and channels are fomenting them,” Seyyed Ahmad Elm-ol-Hoda was quoted as saying. Economic conditions for the Iranian lower middle class has changed adversely in the past seven years. People are facing rising prices, high inflation and taxes and this is making the economic conditions of life harder. Anti-austerity slogans were prevalent in protests in all cities. The price of bread which had been held unchanged over the past ten years, has suddenly seen a 160 percent rise. Price of eggs has risen 100 percent, sugar 45 percent, milk 39 percent and meat 13 percent. The minimum monthly income is now at $270 (USD). At the current rates, a family of four will have to spend all of that money for grocery expenses alone. A number of media and political activists have alleged that the “No to Rising Prices!” campaign was organized by the ultra conservative factions in Khorasan Razavi to attack the Rohani administration and its moderate government. However that strategy has now blown up in both the hardliner and moderate faces: protesters are angry at the conditions of life and they want answers.